Analogies can be confusing for kids. With four words to deal with, they may be left wondering exactly what they are looking for. Of course the trick is to look at the relationship between each pair of words, not just the four individual words, but that concept can be difficult at the beginning. Starting with something concrete and gradually moving up should help kids understand just what they are looking for. Use classroom objects to demonstrate everyday analogies. For example – MARKER : WHITEBOARD :: PENCIL : PAPER. Talk about how each pair of objects goes together: markers write on a whiteboard, pencils write on paper. Present one pair of objects – PAGE : BOOK – and ask kids to think of another pair that goes together in the same way. One possible answer would be – KEY : COMPUTER. In this analogy, both pair of objects show a part/whole relationship. Choose a few of your more dramatic kids, and have them act out this one using facial expressions – SMILE : FROWN :: LAUGH : CRY. Ask if kids can think of another analogy to act out. One example would be – RELAXED : CALM :: WORRIED : NERVOUS. Point out that the first analogy was made up of two pairs of antonyms; the second analogy used synonyms. Once kids have the idea that they are looking at two separate pairs of words, you can give them lots of practice with pictures. At first, set up both pairs of pictures, and ask the kids to tell how each pair goes together. Later, set up the pairs, but leave out the fourth picture. Have kids complete the analogy by drawing the fourth item. 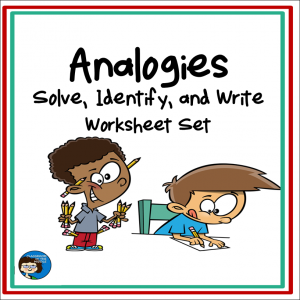 Some types of analogies that should work for this activity include: synonyms, antonyms, part/whole, object/characteristic, object/user, object/location, member/group. All words. Spell out analogies with all words, for example – BOAT goes with DOCK like TRAIN goes with STATION. Kids can demonstrate that they understand what is being compared by underlining the four words of the analogy and circling the two pairs. Words with Colons. Present analogies in their common form – BOAT : DOCK :: TRAIN : STATION. Have kids circle the two pairs and tell how each pair is related – synonym, object/location, etc. Have kids solve a variety of types of analogies by coming up with the missing word. Demonstrate that the way to do this is by first determining the type of analogy. 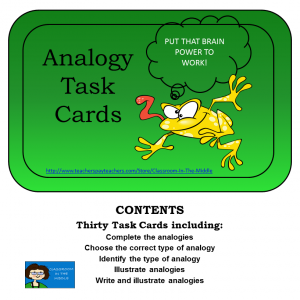 If you are interested in analogy resources, here are some that you will find in my Teachers Pay Teachers Store.